The Kyoto National Museum recently saw the unveiling of an ambitious new extension to the museum – the Heisei Chishinkan Wing. Michael Lambe from Deep Kyoto explains the importance of the “Hall Of New Knowledge”. Chris Rowthorn: My friend Michael Lambe, author of the excellent Deep Kyoto blog and chief editor of the Deep Kyoto: Walks anthology has written a guest post for Inside Kyoto on the new Heisei Chishinkan Wing of the Kyoto National Museum. I recommend that you check out Michael’s blog and have a look at “Deep Kyoto: Walks” (I contributed a rather nostalgic piece to that book). Five years after building began and a full sixteen years after the work was originally commissioned, the new wing of Kyoto National Museum opened to wide acclaim on September 13th 2014. 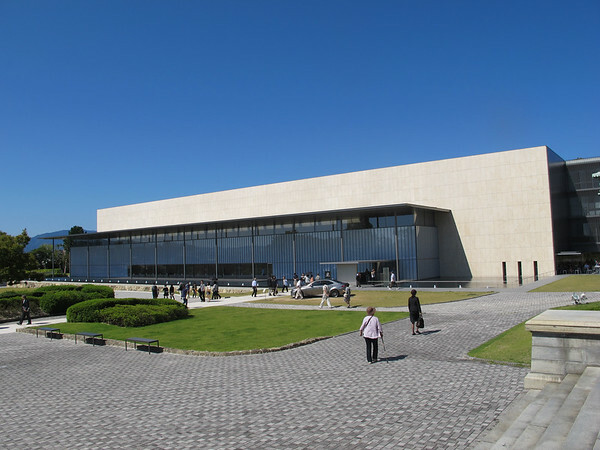 Designed by internationally renowned architect Taniguchi Yoshio, the new wing is named the Heisei Chishinkan. Chishinkan could be translated as “Hall of New Knowledge” and Heisei is the name of the present Japanese era which began with the current emperor’s reign in 1989. The new wing will be used to both store and exhibit the museum’s massive collection of artworks and treasures covering over 12,000 years of Japanese history. Designed with traditional Japanese aesthetics in mind, the Heisei Chishinkan has a sleek simplicity which stands in modest contrast to the ornate French Renaissance style of the original museum building which dates from 1895. Standing adjacent to the old red brick building the new wing is built of steel, glass and limestone, but its tone is more deferential than challenging. Taniguchi deliberately kept the height of the new wing at the same level as the old building’s eaves, and had two stories built underground to minimize the building’s impact. As if to emphasize this respectful stance, the tall, wide windows of the Heisei Chishinkan afford the best views of the old museum and its grounds. On entering the open plan lobby and the outer rest areas of the new building one finds them refreshing, airy, and flooded with natural light from those same tall windows. Going deeper into the building however, the storage and exhibition areas, are completely separated from these rest areas by double walls. These keep out the natural light and help to maintain a strictly controlled climate which protects the museum’s priceless antiquities. One of the most delightful features of this new exhibition area is that it too is open plan, so that you can enjoy multiple views of the floors below as you ascend through three levels. Unlike a traditional museum, where you would follow a strict route of one dimensional views of each exhibit in turn, at the Heisei Chishinkan all the exhibits are open to each other and each floor offers fresh perspectives. This also affords the visitor the opportunity to make fresh and startling connections. Having reached an upper floor and studied a gorgeous 17th century folding screen depicting scenes from Gion Festival, you can then immediately glance down and review the giant 11th century Buddhist statuary on the first floor – but this time from above. To celebrate the opening of the Heisei Chishinkan wing, the National Museum is currently hosting a commemorative exhibition: Kyoto: Splendors of the Ancient Capital which continues until November 16th. Among the hundreds of wonderful paintings, calligraphy works, statuary, ceramics, and archaeological artifacts on display, look out for Sesshu Tōyō’s splendid ink painting of Amanohashidate, exquisitely detailed lacquerware dating back 1000 years, the 4th century Haniwa figure of a farmer in clay, an eighth century cinerary urn glazed in red, white and green that seems almost modern in style, and the transformative 11th century statue of meditating Priest Baozhi – with a Bodhisattva emerging through his face. There’s a lot to see, so leave yourself a few hours to fully appreciate all the beautiful transformations that the exhibition has to offer. 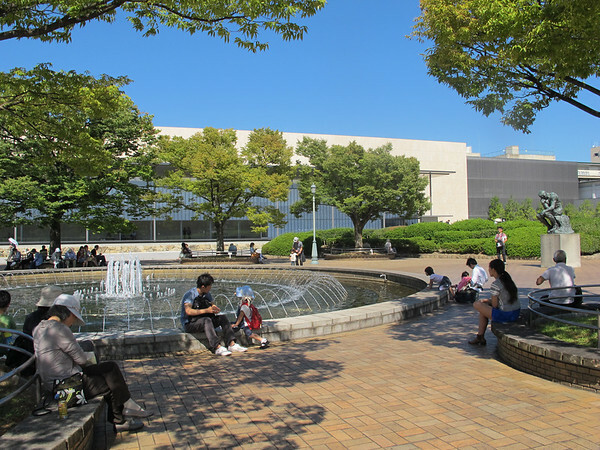 A visit to the Heisei Chishinkan is excellent value at 520 yen for adults, 260 yen for university students and completely free for high school students and younger or those over 70.